Vein of Galen malformation (also known as vein of Galen aneurysmal malformation VGAM or VOGM) is a rare congenital blood vessel malformation in the brain that develops prenatally, though it is the most common arteriovenous malformation (a deformity that includes veins and arteries) in fetuses. A Vein of Galen malformation is a tangled mass of vessels which is an abnormal connection of the arteries and the median prosencephalic vein of Markowski. This congenital malformation develops between weeks six and eleven of fetal development. The cause is yet unknown. In a normal blood vessel system in the brain, there are small vessels named capillaries between big arteries and veins. The brain tissue is typically supplied with oxygen and nutrients with these small vessels. In this abnormal tangled mass, there are no capillaries which are supposed to slow down blood flow and allow for oxygen exchange into the surrounding tissues. Blood flows directly from the arteries to the system of the veins in a Vein of Galen malformation. Because of this connection, blood travels from the heart up to the head and quickly back to the heart, which may demand the heart muscles to work hard, leading to congestive heart failure. The Vein of Galen malformation is sometimes seen upon prenatal ultrasound examination or MRI, but sometimes it is not seen until birth. What is a Vein of Galen malformation? Often the abnormality is detected on the prenatal ultrasounds. It is usually symptomatic in newborns. In newborns, it typically presents with signs and symptoms of congestive heart failure - the newborn may present with difficulty breathing, cyanosis (blue or purple in appearance due to low oxygen), and tachypnea (increased, fast respirations). These newborns often require ventilator support with aggressive management of heart failure. Large head circumference, prominent scalp veins and drooping eyes may be noted. ​Less commonly, it may present in early childhood, much beyond the newborn timing. Early childhood presentation symptoms include: headaches, convulsive seizures, cardiac failure, or hydrocephalus (fluid accumulation in the brain). Pre-natal Ultrasound: Often the dilated “vein of galen” can be identified on a routine pre-natal screening ultrasound done in the 2nd trimester of pregnancy. Head Ultrasound in the newborn infant: A neonatal cranial ultrasound can help identify the lesion. Doppler studies can illustrate the blood flow of the lesion. Brain Magnetic Resonance Imaging (MRI) and/or Computed Tomography (CT) Scan of the head (performed with or without contrast in the veins): Brain imaging can confirm the diagnosis of VGAM and show the anatomy in detail. MR angiography can provide very useful information for treatment planning. Cerebral Angiogram: Cerebral angiography is usually performed in the setting of endovascular treatment. The timing of this invasive procedure depends on the infant’s health and size. See below for more details. Cardiac Ultrasound: May be used to assess the severity of congestive heart failure. 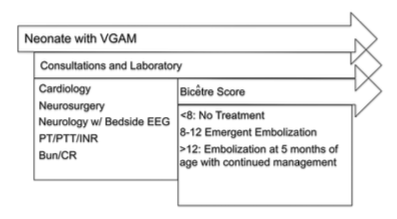 Electroencephalographam (EEG): This test detects for seizure activity in the brain. ​The treatment requires the collaboration of many medical specialties including: neonatology, cardiology, anesthesiology, neurosurgery and neuro-interventionalists. Endovascular embolization is the preferred method of treatment. There is no role for open neurosurgery treatment. 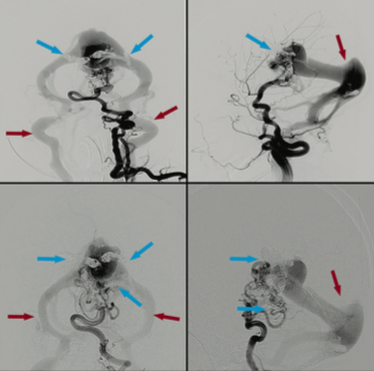 In an angiogram and embolization, the abnormal blood vessels are intentionally closed with coils or liquid embolic agents, which reduce the abnormal blood flow to the vein of Galen. Sometimes, several procedures are required over a period of months. The interventional treatment itself carries serious risks, so timing of treatment and goals of treatment sessions are carefully planned by many specialist doctors working together for the patient. In patients diagnosed as neonates, the timing of the treatment is largely determined by the severity of cardiac dysfunction and health of other organ systems (including brain, lungs, kidneys). In patients who are stable from an overall medical standpoint, the invasive treatment is recommended to take place around 5-6 months of age to allow the baby to grow and better tolerate the procedure(s). There may be multiple procedures over time. However, in many cases due to severe cardiac failure and illness of other organ systems, the treatment is performed urgently in the first several days of life. ​This treatment algorithm and rationale was well defined by Dr. Lasjaunias in France, based on one of the largest experiences in the world. Like any challenging problem in medicine, there are many different ways of approaching the treatment. Our team uses Lasjaunias' Bicêtre scoring system to help decision-making in timing of treatment and to define the safest treatment plans for our patients. Patients who undergo successful medical management and embolization treatment can go on to lead normal lives. The prognosis depends upon how much organ damage exists from the congenital disease process. In untreated patients the prognosis is poor. The disease can be almost always fatal if completely untreated in infants.